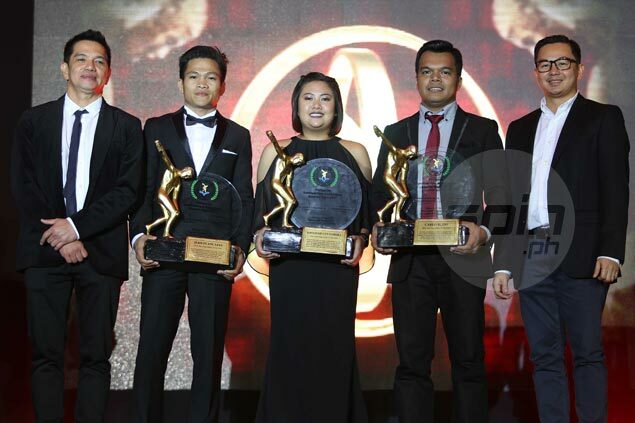 JERWIN Ancajas, Krizziah Tabora, and Carlo Biado formally received the Philippine Sportswriters Association (PSA) Athlete of the Year plum during its awards night on Tuesday at the Manila Hotel. Ancajas, Tabora, and Biado were handed with the Athlete of the Year trophy by PSA president Dodo Catacutan of SPIN.ph and Tapa King vice chairman Julius Magallanes to highlight the affair for the best and brightest athletes of 2017. Ancajas defended the IBF junior bantamweight title thrice in 2017, while Tabora ruled last year’s Bowling World Cup, the first Filipino in 14 years to win the crown. “Super duper special ng 2017 ko. Kumbaga ’yun ang pinaka-highlight ng bowling career ko. Dun nag-escalate talaga,” said Tabora, 25. Biado captured the 2017 World 9-Ball Championship late in the year to add to his World Games and Southeast Asian Games gold medals. “Hindi ko po ma-describe sa sobrang suwerte ng taon sa akin. Bilang boksingero na tatlong beses kami nag-defend ng title, bihirang pagkakataon po ‘yun,” said the 26-year-old Ancajas. Agriculture Secretary Manny Pinol was the keynote speaker during the event attended by several VIPs led by Philippine Sports Commission chairman William Ramirez and newly-elected Philippine Olympic Committee president Ricky Vargas. Samahang Basketbol ng Pilipinas chairman emeritus Manny V. Pangilinan also attended the affair to receive the Executive of the Year trophy for spearheading the country’s successful bid to host the 2023 Fiba Basketball World Cup. Gold medalist in the Southeast Asian Games were also given an accolade following their successful campaign in the biennial meet last year.